I freely admit that I love playoff hockey if for no other reason then the "win or go home" game. Even better is one which goes into overtime and both teams are really playing like there was no tomorrow. In Saturday's NCAA Tournament games there were 2 dandy overtime games that unless you lacked a pulse had you sitting at the edge of your seat. The game that concerned New York Ranger prospects was the 2nd half of the West Regional featuring Steven Fogarty (NYR 2011 3rd) and his 2nd seeded Notre Dame Fighting Irish facing the 3rd seeded St. Cloud State Huskies. Last year it was the Huskies who knocked Notre Dame out of the NCAA tournament so the Fighting Irish were also looking for some revenge. In the first period, St. Cloud would grab a 2-1 lead despite Notre Dame having the better of play and what because of what would become a common theme from this game the outstanding play of St. Cloud goalie Ryan Faragher. Faragher would make key save after key save getting even better as the game wore on. In the 2nd period despite Notre Dame totally outplaying the Huskies, St. Cloud found a way to take a 3-2 lead into the 2nd intermission. Notre Dame had an 18-4 edge on shots and only Faragher prevented more than a single goal during the period. Steven Fogarty I felt played a good game showing more activity than he has been as while he didn't get any credit for it, it was Fogarty who made the play that led to Notre Dame's 2nd goal as Fogarty was using his size to his advantage skating all over the place especially in the crease and slot area which opened up space for his teammates. I don't understand why Notre Dame's coach Jeff Jackson was not putting Fogarty out on the power play using him in front of the net, setting screens and using his 6'3 size over the smaller St. Cloud players. Fogarty would finish scoreless on 4 shots but this was one of his better played games. Notre Dame would force overtime and while St. Cloud would fire shot after shot at Notre Dame's goalie Steve Summerhays (16 shots after just managing 12 during all of regulation), it was Ryan Faragher who would be making highlight reel saves stopping 2 breakaways when his teammates got caught up ice. The free agent junior would eventually stop 39 out of the 42 shots he faced as St. Cloud would score the game winner on a perfect shot with just 2:39 left in the 1st overtime. Notre Dame's season comes to an end and Steven Fogarty ends his sophomore season 3-8-11 which while not great numbers could have been much worse if not for a late season push. 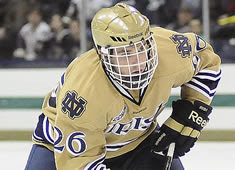 Fogarty it is very doubtful will consider leaving Notre Dame to turn pro as his goal in all the time I have known him has been to earn a degree from Notre Dame just in case hockey does not work out for him. The question for Notre Dame fans will be the status of suspended defenseman junior Robbie Russo (NYI 2011 4th). Russo was suspended at mid-season for academic reasons but remained in school and so far there has not been any hint as to whether or not he will return for his senior season. Russo in just 21 games was 4-11-15 and Notre Dame badly missed him to run their power play. In Kootenay Adam Tambellini (NYR 2013 3rd) and his Calgary Hitmen were beaten before the opening puck was ever dropped as the fans and players of the Kootenay Ice saw the return of Tim Bozon to Kootenay after his bout with meningitis. The emotional scene of seeing the young man who was in a medically induced coma fighting for his life less than 2 weeks ago clearly affected both fans and players (and a few reporters). A scoreless first period gave way to two Kootenay goals in the second period and as the game went into the third, Calgary really was flat at both ends of the ice. Kootenay would make it 3-0 with a goal at 1:44 before Calgary would finally get on the board at 4:28 to make it 3-1. Calgary added a power play goal to make it 4-1 and with just over 4 minutes remaining Calgary would pull their goalie. Kootenay would miss on a shot on the open net and Calgary would get the puck up ice onto Adam Tambellini's stick, Tambellini would fire a shot that rebounded right back to him and he would put it in to make it a 4-2 game. Kootenay would miss on a second empty net chance that Calgary would come right back and score on to make it a 4-3 game with 2:26 remaining in regulation. It took several attempts before Kootenay would finally finish off Calgary as they got their empty net goal with just 37 seconds remaining and a 5-3 lead that would be the final score. Kootenay upsets Calgary in 6 games and moves on to face the winner of the Swift Current/Medicine Hat series. Adam Tambellini finishes the season 5-4-9 in the playoffs after going 17-22-39 in the regular season. Because Tambellini left North Dakota during the season then he is eligible to join Hartford for the rest of their season. Expect Tambellini to head east Monday or Tuesday once he "clears" the Calgary team and can sign an Amateur Tryout Contract (ATO). For Kootenay while they move on Mackenzie Skapski (NYR 2013 6th) has lost his starting job to rookie Wyatt Hoyflin for now, odds are Skapski will wind up getting another shot as the Ice advance. Back in Minnesota, the first seed in the West Regional was Brady Skjei's (NYR 2012 1st) Minnesota Golden Gophers who were facing the Robert Morris Colonials in the opening game. Skjei had both a primary and a secondary assist on 4 shots while going a +3 as Minnesota pulled away in the third period for a 7-3 win. Skjei had a slow start in the first but he set up Justin Kloos for Minnesota's 3rd goal of the first period and that appeared to energize Skjei. Really liked how Skjei can play a "clean" physical game especially when up against smaller players. In the 3rd Skjei would earn his secondary assist on Minnesota's 6th goal which was a shorthanded empty net goal. Islander prospect Taylor Cammarata (NYI 2013 3rd) also had a primary and secondary assist in the eventual 7-3 win as Minnesota moves on to face St. Cloud State for the chance to earn a trip to the Frozen Four. Stephon Williams (NYI 2013 4th) was back up goalie in his Minnesota State's 2-1 loss to UMass Lowell. Williams finishes his sophomore season 5-6 3.23 goals against and a 0.862 save percentage .